Bloomberg View Column: How Long Before a Home Lists for $1 Billion? 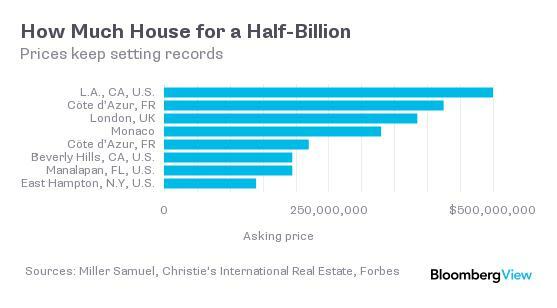 Read my latest Bloomberg View column How Long Before a Home Lists for $1 Billion?. This post went #1 on the Bloomberg Terminal and on the public facing BloombergView.com site for about a day and a half. Crazy. Comments Off on Bloomberg View Column: How Long Before a Home Lists for $1 Billion? When I was called by Bloomberg News about a new Bel Air (LA) listing that was asking $500m and another one down the block by the same architect but different developer at around $400 million, my initial reaction was laughter. I wasn’t doubting that there could be a buyer somewhere out there somewhere…but rather at the absurdity of it. It also seems like a strike against it to have a nearby home done by the same architect, no? According to NAR, the U.S. median home sales price is currently $219,400.